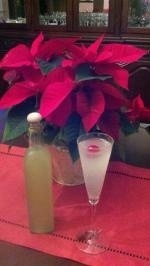 Make some Limoncino for the New Year! 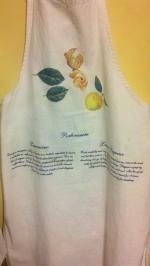 Four years ago I took a trip to Italy, and one of the first souvenirs I purchased was an apron. 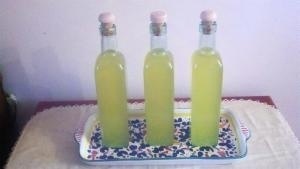 On it was a recipe for Limoncello, in Italian (Limoncino) and in English (Lemon Liqueur). A little research taught me that Limoncino is a Northern Italian name and Limoncello is Southern Italian. As you might guess, the apron was purchased in Northern Italy. I have stared at that apron for four years and decided to give the recipe a try. I guess it was a leap of faith but what was the worst thing that could happen? There are a few things worth noting prior to the endeavor. First and most important was to be sure my scale could measure in grams. Yes, it could I am delighted to report. The next thing was to go to the liquor store to find out what alcohol was. Seriously, no joke, is alcohol vodka or gin or rum? Well, yes it is all of those things, but what my friend Cheryl Butera of Anchor Spirits in Youngstown guided me to was a Polish potato liquor which actually had a lower proof than vodka. I had a flashback to college where we used to throw bottles of the stuff into a garbage can with Hawaiian Punch and act like kids in college (sorry son, what you are doing now is not original! )…oh back in the day! 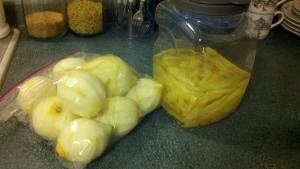 It took about 15-20 minutes to peel the lemons. Be sure not to include any pith because it will make the drink bitter. It was amazing how the lemony yellow color developed over the five days of steeping. I made the simple sugar as described on the apron but know that I will experiment with other flavors in the future. The first one I think I may try is to add a vanilla bean to the sugar and water mixture to infuse vanilla into the drink. Other ideas include sage and lavender and I am going to use my own fresh herbs. Wash carefully and dry 1 kg of untreated lemons (it turned out to be 10 lemons), remove the rinds and let them soak in 1 liter of alcohol for 5 days. Prepare a syrup by dissolving 800 grams of sugar in one liter of water, and cool. Mix the syrup with the alcohol and the rinds, and let them stand for 12 hours (I let it stand another day and a half while I looked for cool bottles and corks). Filter and bottle. The liqueur is ready for drinking. I purchased bottles and corks and know I will start to collect bottles from now on that would make a great gift. For my hair stylist I wrote a description and holiday message on a bottle and shared it with him. I think this may be my go-to gift from now on. On Sunday, I celebrated Christmas with my family and shared this flute with them as they entered the house. You should keep it in the freezer because it is best served cold. On ice, with a little fresh fruit, or shaken into a lemon drop martini you cannot go wrong with this liqueur. So, if you start it today or tomorrow you will have something delicious to ring in the New Year. From my home to yours, blessings at Christmas and always!